The long, cold winter months can feel dark and confining for you and your dog, so when the temperatures start to creep up, getting outside is the one of the first things on both of your minds. The Reston area has a unique combination of city and natural areas, both of which have abundance of activities for you and your dog to enjoy during these warmer months. Below are some tried and true spots where you can bring your dog for a day of fun. This trail is perfect for energetic dogs who need to get rid of the pent-up energy they accumulated over the winter. If your dog enjoys running alongside you while you ride your bike or jog, this trail is for you. Spanning the 45-mile distance between Purcellville and Shirlington, the W & OD Trail runs right through the heart of Reston and can take you to multiple access points in other towns and cities in Loudoun County and Fairfax Counties. 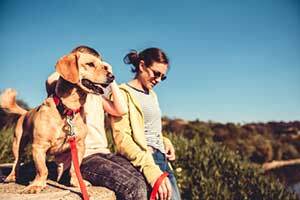 Many of these access points also have dog friendly attractions such as breweries and outdoor patios, so no matter where this trail takes you, your furry friend will be well taken care of. This is potentially the most popular attraction in Reston, for both people and their dogs. Almost all of the restaurants in the town center have outdoor patios, complete with string lights and umbrellas. 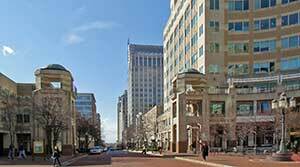 Many of the retail establishments in Reston Town Center welcome dogs inside of the stores, and many also have water bowls and/or treats waiting for your pet by the door outside. Your dog will also be in good company—many residents from surrounding neighborhoods bring their dogs to the town center for walks, so your dog can see and interact with a variety of new faces they would otherwise never meet in your neighborhood. There are many dog friendly restaurants in Reston, but Clyde’s has received top ratings for providing excellent service to dogs and their owners. One visitor remarked that their server made sure to bring their dog a bowl of water immediately, and that every staff member who stopped by the table was attentive to their dog’s needs. When you combine that level of consideration with great food and a wide variety of milkshakes served until 2am, you are sure to have a fantastic time with your whole crew! On May 4th, Pet Fiesta is coming to Reston Town Center! The event runs from 10am to 4pm and admission is free for everyone. It features local businesses and pet products, pets that are looking to be adopted, on-stage entertainment, and artists who will be doing caricatures and face painting. Pet Fiesta is perfect for family members of all ages, whether they have two or four legs. The Wine Cabinet, located in the Northpoint Village Center, offers a wide variety of bottled wines, craft beers, and related gifts. They welcome leashed dogs inside the store so you can shop while letting your dog explore the store. This dog park allows your dog to take a break from their leash! It features separate small and large dog enclosures, complete with water spigots so your dog can stay cool and hydrated. For your convenience, there are plenty of benches, plastic bags, and trash cans throughout the park. 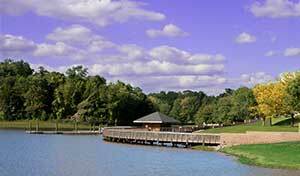 Lake Fairfax Park offers a wide variety of activities to keep you and your dog entertained. Dogs are welcome on the trails and on the campgrounds, so you can pick a warm night to pitch a tent and watch the stars with your pal. Visitors have noted that everyone who visits this park is considerate of other attendees and that even when cyclists are using the trails, it is easy to share the paths with visiting dogs. For more information on booking a camping space, a full list of rental costs, and visitor information, head to the Fairfax County Parks Website. If you are planning to leave town or find yourself rushing from one activity to the next, consider pet sitting services to keep your dog entertained and well taken care of while you are gone. To speak with someone about finding the best Reston VA pet sitting services for your family, contact Paw Pals, so while you are away, your dog can play!